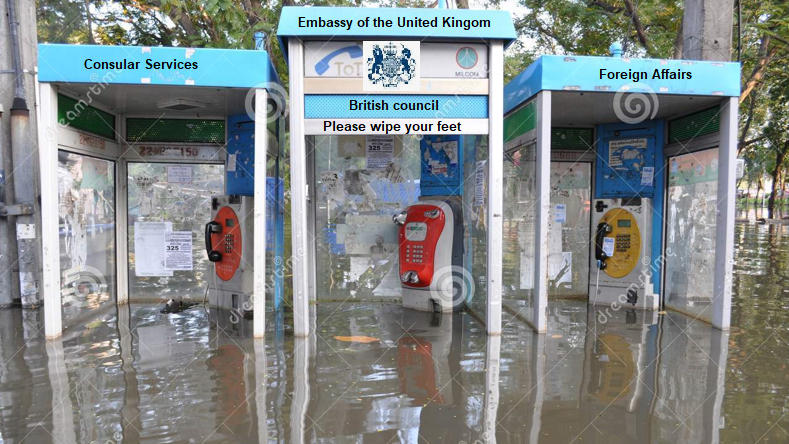 British Embassy Bangkok sale: 426 million pounds spent on our "World Class Diplomacy"
The money will be spent on the Foreign Office's "world class diplomacy". And it has also been revealed that a new embassy and residence will be constructed elsewhere. The British embassy trumpets that there will be no interruption to their service this year. 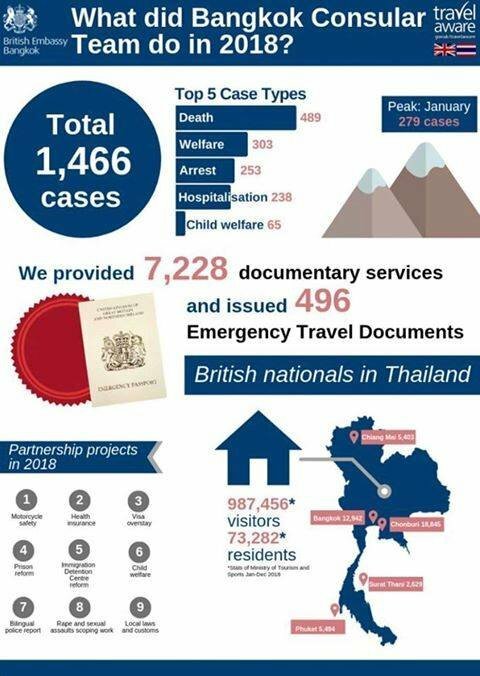 Further requests from a Thaivisa member for clarification of recently published embassy work figures also reveal that 250 expats and residents were among 489 cases of death dealt with by staff in the last year. But Freedom of Information Act regulations meant that details about murder, manslaughter and suicide victims could not be precisely conveyed. Though accidental death of British nationals was 13 with six dying in road accidents. The request for information was made to the Foreign and Commonwealth Office Central Freedom of Information Unit by a Thaivisa reader who asked to remain anonymous. The reader asked for clarification on the breakdown of the number of deaths in the kingdom, what constitutes welfare and what the FCO propose to do with the money from the embassy sale. "The sale of the compound raised £426 million. The funds will be reinvested across the FCO’s Global property portfolio, enabling us to continue to update and modernise our global estate so that it meets our aspiration to provide a world-class platform for diplomacy and the promotion of Global Britain. This includes a new Embassy and Residence, designed for our needs in the 21st century, on new sites in Bangkok later this year. There will be no interruption to our consular service". Regarding the 489 deaths death with by the embassy it was stated that the Freedom of Information act precluded giving details of information where there are five or less in a category as this might identify those concerned. Death from murder or manslaughter: Less than or equal to five. Death from suicide: Less than or equal to five. Number of expats or British citizens in the figures: 250 - 94 temporary and 156 permanent overseas residents died. What actually constitutes welfare (named in the report as 303 cases). Breakdown: Health case, 147, Financial issues 105, Immigration 50, Unknown 1. Though conveyed to a private individual the information above is deemed to be in the public domain. World class diplomacy............... At least some one has a sense of humour. I'd be interested to know how much of the 426 Million will be spent on providing services right here in Thailand? I have to state that the level of those services being provided to us of late, has been significantly lower than that which could accurately be described as world class. FCO "Foreign and Commonwealth Office"... who's wealth are we talking about here? "The British embassy trumpets that there will be no interruption to their service this year. " So no change, no help whatsoever for UK expats. Pity that FOID did not ask for the REAL reasons behind the decision to withdraw providing 'income' letters. Why don't they sell the Foreign Office estate in Whitehall which would raise a great deal more than the paltry £426 million obtained for the Bangkok site? This would enable the FCO to invest further in their "Global property portfolio" and go further to satisfy their 'aspiration' to provide a 'world-class platform' for diplomacy. What is wrong with these people? Are they being economical with the truth about a new Embassy or are they just being slippery about the dump in Sathorn they have leased? Why do they write in such a brainless and illiterate way? it seems odd given that the upper scions etc are extremely well educated and presumably intelligent? Probably the decision on the wonderful old Bangkok site was inevitable but couldn't they take a break from their endless diversity workshops and think about an honest way of communicating the news. They should have said the sale was a matter of great sadness and regret, and that the charm and history of the old site would never be forgotten. They should have said the decision was driven by economic necessity and the extraordinary rise in land prices in Bangkok. They should have explained the details of the new arrangements. Above all, they should not have pretended that this sad occasion was somehow a positive step. I.e. drop in with a packet of smokes and tell you you're banjaxed because there is nothing they can do. So foreigners can own land then? I thought it was a gift and what will happen to good old Queen Vic statue which 'protects' the place? Back in 2008 they seem to have spent a lot of money renovating the place - no doubt all for the wrecking ball. We are selling the family silver times must be hard. The statue of Queen Victoria is a copy from the same mould of the statue at Winchester designed by Sir Alfred Gilbert for the Queen's golden jubilee. The plinth bears the inscription, "Victoria, Queen of Great Britain & Ireland, Empress of India. Erected in loving memory by her subjects in Siam. 1903." 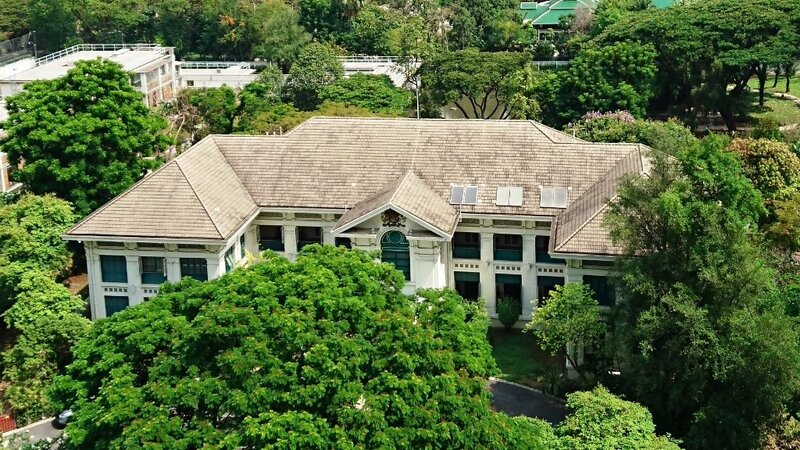 Originally situated outside the entrance gates to the legation on Charoen Krung Road, it was subsequently moved when the mission relocated to the new compound and again when part of the site was sold in 2007. The statue was boarded up when the consulate was occupied by the Japanese during World War II, but a peephole was left, symbolically allowing the Queen to see outside. The statue also used to be popular with local Thais, who would leave offerings in exchange for good fortune, help in exams, or success in bearing children. One good thing is, now that everyone carries a mobile phone, there are plenty of cheap, empty phone boxes available for them to move into. They might even manage to get all the departments into one location.